Hedges are good investments which can ensure privacy to your property, noise isolation and add life in your outdoor area. They need proper maintenance all year round. It is better to have your hedges light pruned oftener than rarely and heavily cut them. We can offer you our professional hedge trimming services which we provide in Highbury N5 to property owners and holders of commercial estates. Use the services of our qualified gardeners to keep the shrubberies around your estate in excellent condition during the whole year. They are affordable and trustworthy. After in initial inspection, our staff will provide the pruning and shaping of the shrubs to keep them in control. Overgrown bushes can take the most of the garden and lead to thinning of the plants. Our gardeners have the necessary skills and equipment to provide professional pruning of young and mature shrub plants. Get your garden area maintained in good condition using our affordable hedge trimming services which can be used in Highbury and nearby. 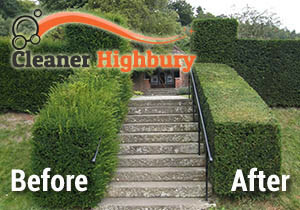 We carry out formative and ongoing trimming of hedgerows and bushes. Use our call centre to schedule the inspection and maintenance of your plants and you will receive a free quotation. Conifer, evergreen and deciduous hedges require pruning at a different time during the year. Some need a few times trimming, others – once in the year and this ensures the healthy and thick condition of the plants. 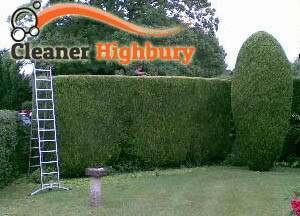 Use our hedge trimming services which are at your disposal in and near N5 London during weekdays and weekends. You will get professional advice, effectively done work and plants that are at their best. Book other of our gardening services to make your outdoor area presentable, clean and look good. We can make your yard and garden plants well maintained and properly developing. Feel free to contact out customer centre or use our booking form.